This history of settlement in the Dulles area is, by and large, a sample of the greater Northern Virginia region's history. For most of its existence, Northern Virginia has functioned as a hotbed of agricultural activity and settlement. Such culture in the region met its end within a decade of Dulles Airport's construction, which brought sweeping changes to the area's economy and demographic, transforming the entirety of Northern Virginia into an independent megalopolis rivalled by few others in the nation. Dulles Area Connection separates the Dulles area's general history into three contiguous periods of distinct patterns of growth and development in the region. In addition to a generalized history, we can take a closer look at settlement in the Dulles area by examining the history of communities and establishments within a narrower scope defined by a geographic region encompassing only the airport and the surrounding land within the range of a mile. The area examined for closer study is bounded by latitudes 38o 59' 14.0424" (North) and 38o 51' 53.3046" (South) and longitudes -77o 33' 44.9598" (West) and -77o 23' 33.6228" (East). This 58.17mi2 zone partally includes zip codes 20105, 20120, 20143, 20148, 20151, 20152, 20164, 20166, 20170, 20171, and 22033. 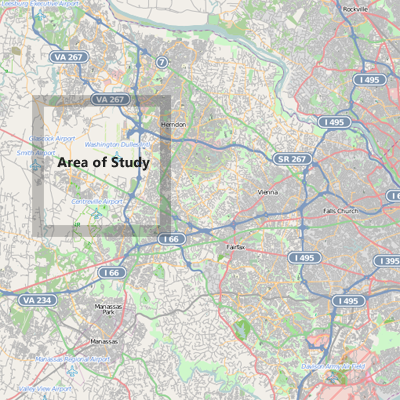 The area of study comprises of approximately 23mi2 of Fairfax and 35mi2 of Loudoun counties, respectively. The modern-day communities of Brambleton, Sterling, Arcola, Pleasant Valley, South Riding, Conklin, Centreville, Chantilly, Oak Hill, and Herndon are either partially or fully included in this zone.